Crank up the Joy Division and touch up your eyeliner: Nintendo has officially announced plans to release a solid-black 3DS XL handheld in North America. Though the 3DS XL handheld is an awesome device, both technologically and by virtue of its game selection, it's always been a bit garish. Red and black? Blue and black? Pink? Who designed these color schemes, and why are they so heavily medicated? Fortunately Nintendo has come to its senses, and having realized that some members of its fanbase are fashionable, ambulatory balls of self-loathing and cynical detachment, the company has revealed plans to release an all-black 3DS XL here in the US. Nintendo's announcement stresses the fact that the black handheld will be released on August 11, the same day that Mario & Luigi: Dream Team makes its retail debut. Why? 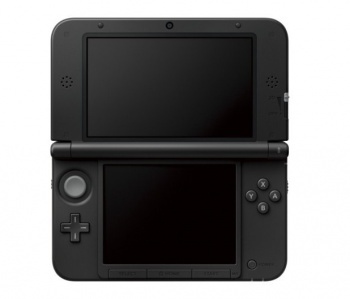 Because this stylish 3DS XL is apparently only available as part of a $200 bundle with that game. It's currently unknown whether the system will eventually be available for purchase by itself, but Mario & Luigi: Dream Team certainly will be.